1. This is one of those 'screw driver with a cut in it' principle tools. 2. These are my soft metal pliers. They work well on soft stainless and softer. They were made to be as light as possible. The 'needle nosed' pair has both jaws rounded on the inside to a curve that matches a 1/4" ring (except toward the tips, so i can work smaller ring id's too) so that i can reach inside the ring and pull down to shut it. The flat pliers were made with the jaw shape shown next to it, which allows me to use the tiny pertruding part as a 'needle nose' type thing, or i can just use them normally. 3. These are my medium metal pliers. They work on up to 15 gauge mild steel, or 17 gauge 1/2 hard stainless steel. 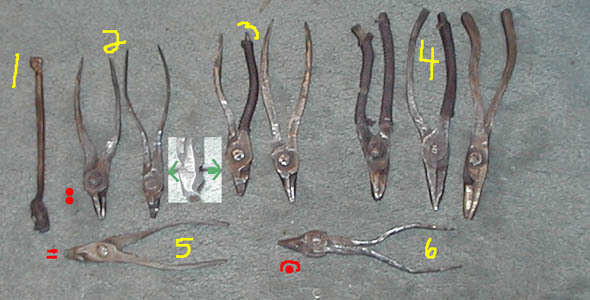 The needle nosed are flat, and the other pliers have my jaw shape of choice. *A note on my needle nose pliers--i keep the jaw short because i feel that the long jaws arent needed and only get in the way. 4. These are my hard metal tools. The jaws on these really are nothing special. I made the handles that shape so i could grip the hard metal better. 6. These pliers have one side that has a 1/4" radius and the other that has a 1/4" cavity. The jaws are needle nosed shaped. These work well with working on rings 1/4" or smaller when you either use the 'pull down' method of closing rings, or need to re shape them a bit.